If you are looking to celebrate a special occasion or host a corporate event, we’d be delighted to hear from you, and even happier to help you organise the whole thing. Anything from a full set menu or finger food and nibbles can be sorted, and we’ll help you plan and personalise the event to suit you. We love giving you good value as much as you like receiving it. So chat to us about a personalised drinks package. We can do three drinks for €15 per head, including house wine, a signature cocktail or beer, all alongside complimentary still and sparkling water. Sitting in the heart of Grand Canal Dock, Charlotte Quay’s location couldn’t be more perfect for a central yet picturesque breakfast meeting. 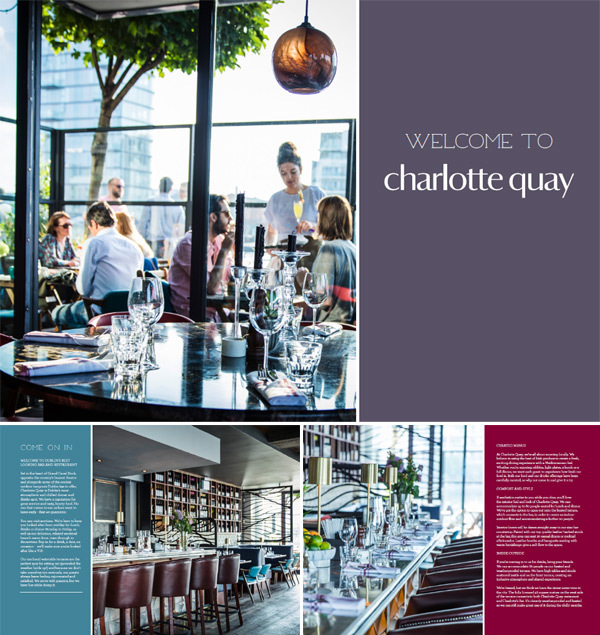 With it’s beautiful waterfront views it is the ideal venue to bring clients, customers and colleagues to. It’s available on an exclusive hire basis with an extensive menu to choose from. some canapés and supper bowls and turn it into a proper occasion, or even let us serve a sit-down meal in the restaurant after or before your class? Sample some of the best whiskeys there are and become a true master of tasting. We run whiskey tasting classes for ten or more people giving you the chance to experience something fun and different. Of course, we can add canapés to the occasion for hungry guests, or arrange a full sit-down dinner in the restaurant. Download a brochure or get in touch for more information.